However, I'd be very happy if you spread the word by mentioning this candy with a link and/or photo, either on your own blog (sidebar is fine) or other if you don't have a blog, like a pin, instagram, facebook, twitter etc. But please ~ NO 'Candy only' bloggers! My favourite song is... 'Santa Claus is Coming to Town' from Michael Buble! Have a Holly Jolly Christmas this year! Stamps/Images: AuroraWings aka Mitzi Wiuff digistamps 'Kitten in a Stocking' & 'Puppy In A Boot'. Fresh Brewed Designs 'Warm my heart mug'. Sweet Pea Stamps ~ Ching Chou Kuik 'Deep in the night, Lingeringly'. 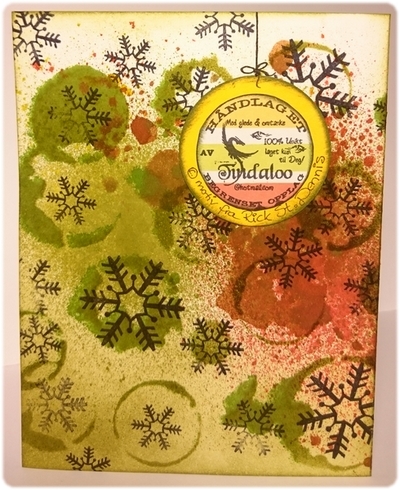 Creative Stamping magazine issue #27 'Woodland Christmas Clear impressions set'. Lazar StudioWERX Inc 'Funky Holidays' (swirl). North Star Stamps CS 'Vennskapsoppskrift' & 'NSS Juletre med God Jul'. Eat Cake Graphics 'Speedy snail delivers the mail'. Createwings Designs digital frame from the 'Tiny Treasure kit'. Papers: Bazzill cardstocks. Plain white cardstock. No designerpapers this time! The background papers I've watercolored with distressinks on Canson Montvale aquarelle paper (200 g/m coldpressed). Embellishments/Tools: Marianne Design 'Circle and Flower Stitch CR1248'. Sizzix Bigz Die 'Reindeer with Antlers'. Sizzix Textured Impressions Embossing Folders 2PK 'Country Cottage Set'. Spellbinders™ Nestabilities 'Labels 8 - S5019' & 'Curved Rectangles S5006'. Martha Stewart 'Flourish Edge Punch'. EK Success® Whale Of A Punch 'Large Circle 1.75' & 'Inverted Corner Punch'. Gold punchinella. Søstrene Grene 'gold polkadots' washitape, & MT washi 'diamond green'. Nille memories glitzy green / bling embellishes. Making Memories metallic brads. Techniques: I always use my Scor-Pal to score n fold my cards. And my distress tools from Ranger Ink is always in use! ~ Tim Holtz® Mini Ink Round Blending Tool & the Inkssentials Ink Blending Tool and Foams. I used misc. Luminarte Twinkling H2o's Shimmering Watercolors, and Tim Holtz Distress Ink pads & markers to watercolor and distress image and papers. Glossy accents. Baby Buggy ~ Shaker EaselCard! The Theme is as always 'Anything Goes', create whatever you wish, and you are most welcome to join in! 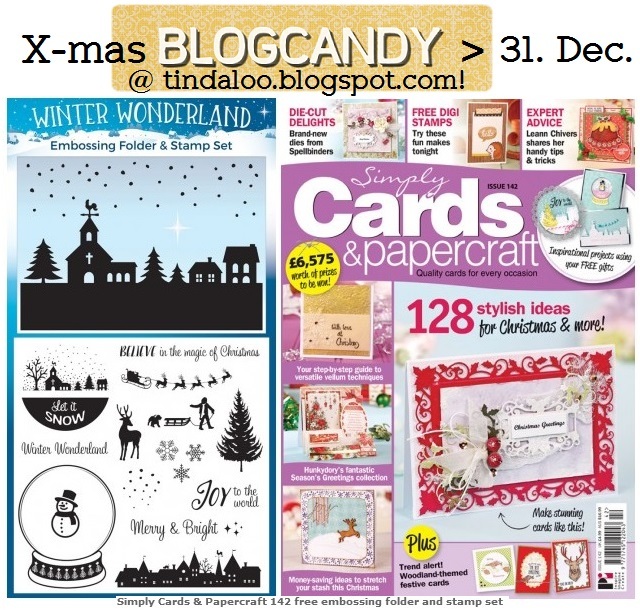 :) Oh, and Did you see I got a new X-mas Blogcandy? I've also used the most effective easel stand-up-helpers die from Elizabeth Crafts, an absolute must have! Watch the youtube video where Els Van Der Burgt from Elizabeth Craft Designs explains how to use the dies! Stamps/Images: Kort & Godt CS 'M-152 Baby Dåp'. Staz CS 'Prins og Prinsesse'. Papir Design CS 'Barnedåp 107955'. Papirloftet CS 'Nyfødt Stempelsett'. 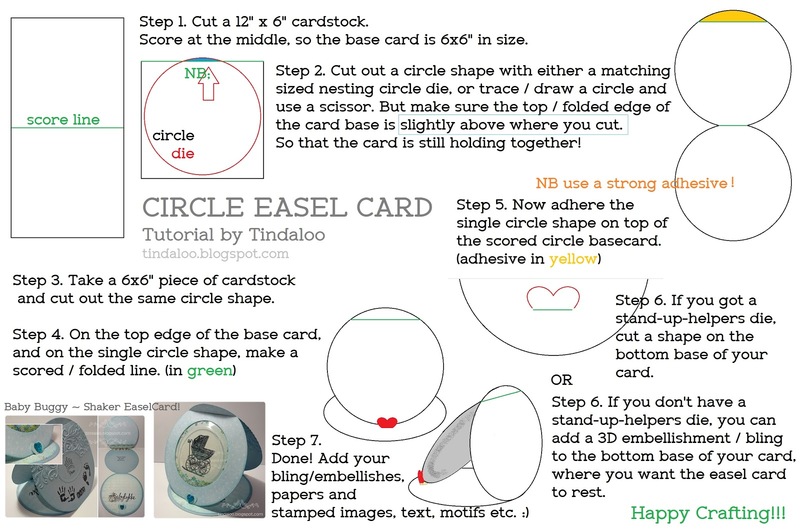 Papers: Bazzill cardstock. Panduro Hobby 'Joyeux Nóel' paperpad, and Vibeke Spigseth 'Summer breeze - Cool Shade'. 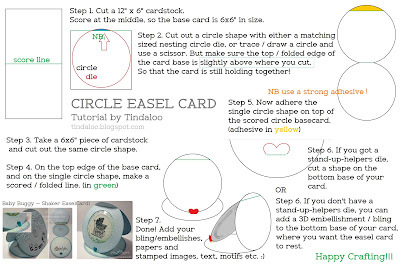 Embellishments/Tools: Crafts Too Presscut 'Circle Nesting Dies PCD46'. Elizabeth Craft Metal Die 'Stand Up Helpers 1-792'. Simply Cards & Papercraft magazine #135 freebie 'fancy flourish' embossing folder. Misc washitapes from Scraplovers & Papirgleder. Bling and sequins from sellers on Ebay. Techniques: I always use my Scor-Pal to score n fold my cards. I prefer Canson Montvale aquarelle paper (200 g/m coldpressed). My distress tools from Ranger Ink is always in use! ~ Tim Holtz® Mini Ink Round Blending Tool & the Inkssentials Ink Blending Tool and Foams. I used misc. 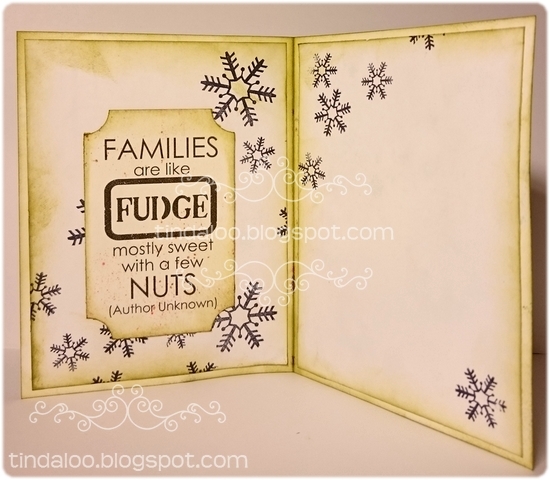 Tim Holtz Distress Ink pads 'Broken China' & 'Tumbled Glass' to lightly watercolor the buggy, and distress the edges of the papers. Glossy accents, Gluedots & Miracle tape. 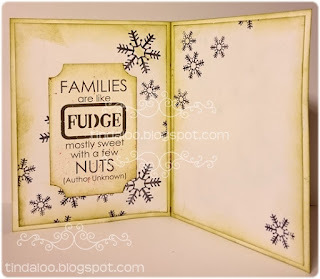 First of all I wish to announce the winner of the sweet Cherished Christmas rubberstamp I gave away in my Sweet Pea Stamps bloghop post! To all the others who didn't win ~ if you haven't seen it yet... I got yet another Blogcandy up for grabs! Stamps/Images: Rick St. Dennis MFA RSD digistamp 'ScreAmIng Me Me mutant 4'. 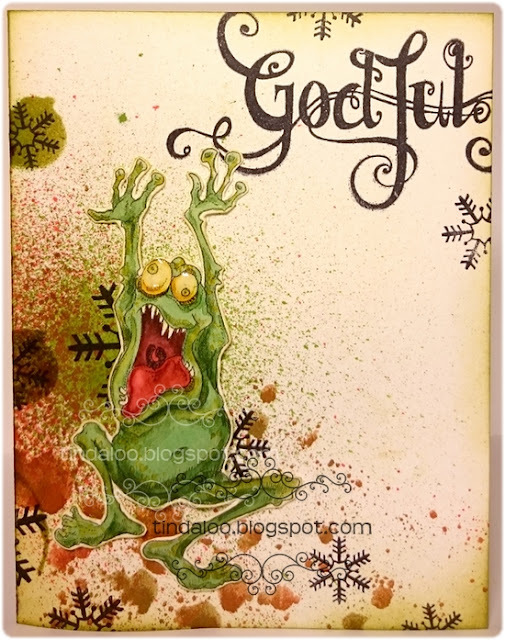 Panduro Hobby clearstamp set 'God Jul'. STAZ clearstamp set 'Oldemors Pepperkaker'. Papers: Plain white cardstock and aquarelle paper. Embellishments/Tools: Unknown stencil 'coffee stains' EK Success® Whale Of A Punch 'Large Circle 1.75'. Techniques: I always use my Scor-Pal to score n fold my cards. I prefer Canson Montvale aquarelle paper (200 g/m coldpressed). My distress tools from Ranger Ink is always in use! ~ Tim Holtz® Mini Ink Round Blending Tool & the Inkssentials Ink Blending Tool and Foams. I used misc. Luminarte Twinkling H2o's Shimmering Watercolors, and Tim Holtz Distress Ink pads & spray stains to watercolor, stencil and distress image and papers. Glossy accents.